Los Angeles International Airport, situated close to the famous coast of California, is well known as the gateway to the Pacific Rim. One of the largest international airports in the world, LAX (as it is commonly referred to) is unique in that serves as a hub for five major airlines! Los Angeles International Airport (IATA code: LAX) is the busiest airport in the state of California and the hub for Alaska Airlines, American Airlines, Delta Air Lines, Southwest Airlines and United Airlines. Flights to Los Angeles International Airport are provided by international airlines such as British Airways, Air China and Air New Zealand. 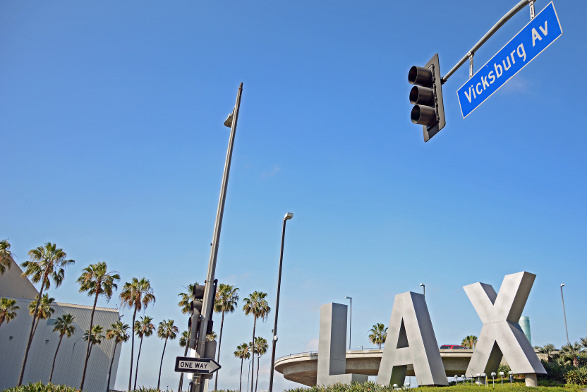 LAX is a 20-minute drive from the city centre of Los Angeles. Book your cheap flights to and from Los Angeles International Airport online! Los Angeles International Airport is the second busiest airport in the United States. LAX schedules flights to and from Europe, Latin America, Asia and Oceania. Originally starting out as a ranch when California was still a Mexican province in the 1830s, this land started attracting pioneer aviators in the 1920s, which provided the perfect opportunity to turn it into an airport. In 1928, the Los Angeles Municipal Airport opened. In 1941, the name was changed to Los Angeles Airport and in 1949, it finally became Los Angeles International Airport. In 2016, LAX welcomed more than 80 million passengers through its doors, making it the fourth busiest airport in the world by passenger traffic. When you have some time to spare at Los Angeles Airport, explore the wide array of shops and duty-free shops. At these retail outlets, you can buy jewellery, snacks, books, newspapers, electronics, cosmetics, medication, fashion, sportswear and more. Be sure to check your local baggage restrictions at LAX. When you’re done with all your shopping and seeking some refreshments, visit any one of the huge number of restaurants, cafés, bars and other various eateries. Enjoy choosing from a range of different meal options. Los Angeles International Airport features a host of lounges throughout all the terminals, operated by the likes of Alaska Airlines, American Airlines, Etihad Airways, Air New Zealand, Star Alliance, Korean Air, Emirates, Qantas, Delta Air Lines, Virgin Atlantic, Air Canada and United Airlines. These lounges include features such as Wi-Fi, refreshments, printers and copiers (business lounges), TVs, flight monitors, telephones, newspapers and magazines. The main airport of Los Angeles includes an Art Program, which gives visitors access to a variety of contemporary artworks, with local and regional artists showing off their skills through temporary exhibitions, art installations and cultural performances. LAX offers Wi-Fi access, which is free for 45-minute sessions. A high-speed Wi-Fi service is also available, at 24-hour access available for $ 7.95 per device, and unlimited access for $ 9.95 per month. Other facilities include a lost and found desk, currency exchange facilities, ATMs, a first aid station (in the upper departure level of the Tom Bradley International Terminal) and nursing rooms. Courtyard by Marriot LAX This 3-star art deco hotel in the LAX area is a 5-minute drive from Los Angeles International Airport. It includes amenities such as breakfast, a spa, a fitness centre, valet parking, a business centre, a 24-hour business centre, a 24-hour front desk, a restaurant and a bar/lounge. Free Wi-Fi and free airport shuttle are also available. Hyatt Regency Los Angeles International Airport This beautiful 4-star suburban hotel is situated within a 5-minute drive from LAX. Amenities included are an outdoor pool, a fitness centre, air conditioning, a snack bar/deli, a restaurant and a bar/lounge. Free Wi-Fi and a free airport shuttle are available as well. The Ritz-Carlton, Marina del Rey This charming 5-star luxury hotel offering a scenic setting is a 15-minute drive from Los Angeles International Airport. Its many amenities include a full-service spa, access to the marina, an outdoor pool, breakfast, a business centre, air conditioning, daily housekeeping, a restaurant and a bar/lounge. Free Wi-Fi is available in the lobby. Make sure to order your foreign exchange 60 days before you collect. Foreign exchange orders can only be collected in person. ICE currency exchange booths are situated on the departure level after security in Terminals 2, 3, 4, 5, 6, 7 and Tom Bradley International Terminal. More exchange booths are available on the arrivals level in Terminals 2, 5, 6, and Tom Bradley International Terminal. Los Angeles International Airport features a multi-story parking area for short and long stays. The rate is $ 3.00 for the first hour, with each 30 minutes thereafter costing $ 2.00. 24-hour periods cost $ 30.00. You can reserve your parking on the airport’s website. Los Angeles International Airport is situated 29 km to the southwest of the city centre of Los Angeles. Shuttles, buses, long-distance vans, trains, taxis, Uber and car rental options are available to take you from the airport to your destination.